1. Greetings from the Centre for Science and Technology of the Non-Aligned and Other Developing Countries (NAM S&T Centre)!! 2. 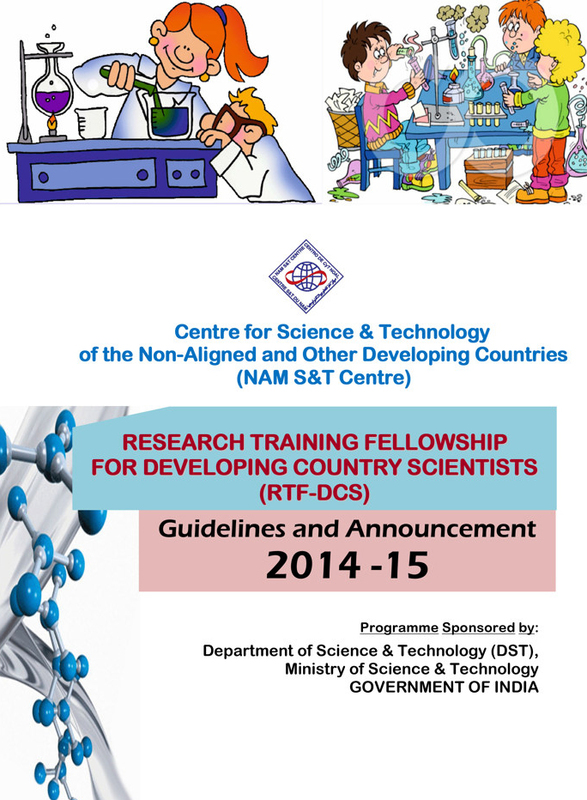 The NAM S&T Centre invites applications from the scientists, technologists and engineers of the developing countries for the award of the Fellowships under its 'Research Training Fellowship for Developing Country Scientists(RTF-DCS)' scheme for the year 2014-15. The RTF-DCS Programme was initiated by the Centre two years ago with full financial support of the Government of India, Department of Science & Technology (DST) and is aimed at capacity building of the developing countries in the fields of Science & Technology through the affiliation of their scientists with the Indian scientific and academic Centres of Excellence. (iv) Eligibility Conditions: Scientists/ researchers from any developing country (except India) below 40 years of age, possessing at least a Master's Degree in any Natural Science subject or equivalent degree in Engineering or Medicine and allied disciplines. (v) Financial Terms: Full financial assistance to the Fellows, including (a) round trip international airfare by excursion/economy class, (b) a consolidated monthly Fellowship amount of Indian Rupees (INR) 35,000 [about US$575 at the current exchange rate] (non-taxable) to cover accommodation, meals and other miscellaneous expenses and (c) a one-time grant of INR 15,000 [about US$250] for domestic travel, including airport transfers, visiting research institutions, attending scientific events and field-trips within India. The Indian host institutions will also be suitably compensated for their services for implementation of the programme. 4. Detailed guidelines of the Fellowship scheme are given in the attached Announcement Brochure. To prepare the proposal, the applicants should carefully study the material available in these guidelines. It is advisable for an applicant to make a prior contact with an institution where work is in progress in the area of interest to the applicant or a concerned Indian scientist, and obtain consent that the applicant, if selected, will be accepted to work in the institution on the proposed research project. A copy of the consent letter should be enclosed with the application. A suggestive list of Indian academic and research institutions has been enclosed with the Announcement, but the applicant is free to contact any other institution in India about which information may be gathered either through Internet search or other means. However, even if an applicant has not been able to secure such prior consent, the NAM S&T Centre will try to find a suitable matching institution for him/her. 5. Application should be submitted to the NAM S&T Centre in the prescribed format (enclosed with the Brochure). Only electronic communication will be accepted, therefore filled-in application form and the enclosures should be sent as attachments to an e-mail, after scanning the documents wherever required. Please do not send hard copies of the application. 6. Selection will be made by an International Selection Committee and will be based on the quality of the research proposal submitted by the applicant, applicant's academic merit and available slots in the Fellowship scheme. You are earnestly requested to please widely disseminate this announcement to the concerned researchers and research institutions in your country.